There are a number of particularly bad weed species which can be tough and costly to deal with once established. 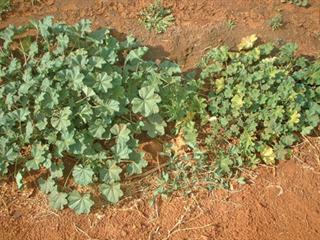 The mallow plant on the right is infected with spotted wilt virus. Being able to recognise these and eliminate them as soon as they appear will save many headaches. One such weed is the small mallow (Malva parviflora). It’s able to survive for very long in the soil. 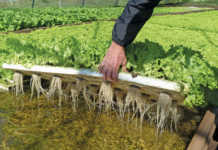 One seeding will result in some seeds germinating each year for a number of years. 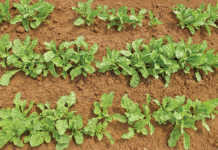 It’s also able to withstand many common herbicides used on vegetables and will usually require removal by hand – something which we hope to avoid with our high labour costs. It’s because of this that many farmers don’t bother with it, as the weed may only appear sporadically in the land – at first. By the time the farmer realises this is a serious weed, it’s too late. The seed can come into the land from manure, and this is probably the main source of new infestations. 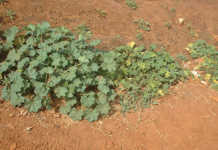 The weed thrives in rich soil and can often be found on the edge of kraals, where the cattle may graze it and pass it through their dung. It’s also often found growing in ditches and the side of lands, especially if manure was stacked in these places. To make matters worse, it’s also a perennial weed with a deep taproot which enables it to survive harsh conditions. Furthermore, it’s one of the few weeds which can withstand treatment with methyl bromide. This actually destroys the ‘hardness’ of the seeds causing all of them to germinate at once. I’ve seen lands treated with methyl bromide where small mallow came up like the hairs on a dog’s back. You need to destroy small mallow before it sets seed. There’s another incentive to clear this weed from verges. It can be infected with the spotted wilt virus and thus become a source of infestation in lands and tunnels. The weed is able to withstand hot as well as frosty conditions and, if infected in summer, it can carry the virus through winter and infect crops as the virus cycle is not broken. One farmer I know had this weed growing in a wastewater ditch and would get an infestation every year until he eliminated the weed. In any case it’s always a good practice to kill all over-wintering weeds on land verges, near sheds and elsewhere. Small mallow is only one of a number of cold-tolerant weeds able to carry viruses through winter. Another such culprit is sow thistle. Another weed to look out for is shepherd’s purse (Capsella bursa-pastoris), a cool season weed which can spread extremely rapidly. The leaves start off as a flattened rosette near the ground. The weed soon sends up as a relatively long raceme with small white flowers and, finally, produces dozens of heart-shaped pods full of small seeds. On my property I missed one plant which next season had a large cluster of them, and found a number even further away, washed there by the rain. It took a few seasons to get this weed under control and I still find the odd plant emerging. I also came across a farmer who had planted a pasture grass in autumn and this weed came up in such numbers that it completely covered the newly-emerged grass. Always remove a weed that you don’t usually have on the farm. It may not be an invasive weed, but if you don’t know for sure, it is not worth taking a chance. Contact Bill Kerr on 016 366 0616, or at [email protected]. Please state ‘Vegetable production’ in the subject line of your email.